Though there are many methods to choose from in the field of agglomeration, two methods are commonly compared against each other when dealing with material fines: compaction granulation and pelletization. Both methods are an effective solution for agglomerating material fines, but each has distinct advantages and disadvantages. And while cost is often the deciding factor between the two, there are many things to consider when choosing which method best suits your material and processing needs. The following is a general overview of the two processes as compared to each other. 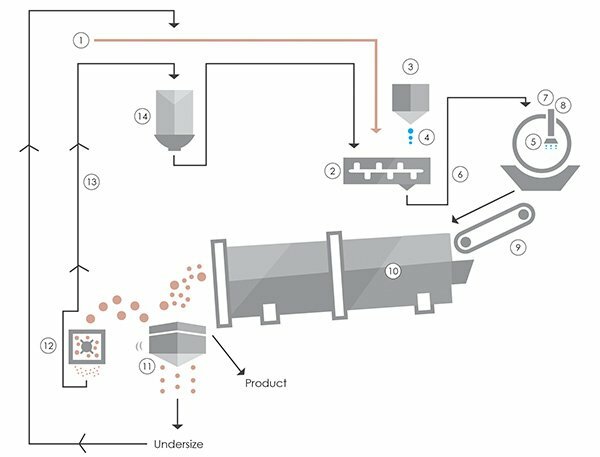 Pelletization is a form of tumble growth agglomeration, whereby material fines are “grown” through a tumbling motion and the addition of water or a binding agent. This process is a non-pressure method of agglomeration, and instead of pressure, uses a binder (or simply water) to help material adhere to itself. Because of this, this type of agglomeration is categorized as a wet process. Pelletizing is carried out using either a disc pelletizer or rotary drum, with disc pelletizers being the most common choice, and drums being more suited to specific applications such as heap leaching. Material feed and binder can be thoroughly mixed prior to entering the disc pelletizer. This creates a homogenous mixture and evenly distributes the binder. The majority of the moisture required for pellet formation can be added (in the form of the binder) during mixing, so it need not be done on the pelletizer, a process which can be lengthy. In many cases, the use of a mixer prior to the disc pelletizer often increases production rates because of this. Material that is pre-conditioned is densified through the motion imparted by the mixer. Because this densification is achieved through mixing, less binder is required to create the same densification, resulting in reduced binder cost. Once material has been conditioned, it moves on to pelletizing. For processes that do not use a pre-conditioning step, this is where the process begins. Here, material is fed onto a disc pelletizer at a continuous rate, where binder is continually added. The material fines are tacky as a result of the binder, and as they tumble against themselves while the pan rotates, they pick up more fines, growing in similar fashion to a snowball. Once pellets have reached the desired size, they exit the disc pelletizer, and are carried via a conveyor belt or steep incline conveyor to a dryer. The dryer “cures” the pellets, removing any moisture, and “polishing” them into their final form. Drying is commonly carried out using a rotary dryer, with fluid bed dryers being the alternate choice. 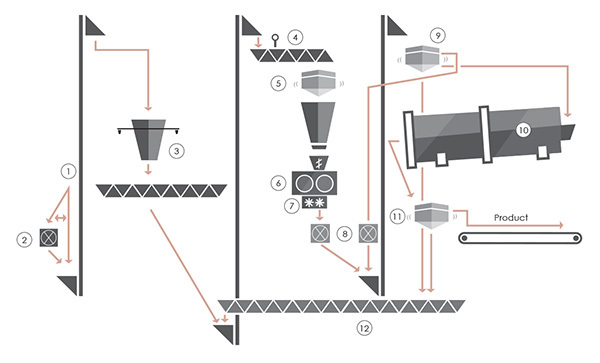 The diagram below illustrates a simplified pelletizing setup. In situations where a rotary drum is used instead of a pelletizing disc, the process is often the same, with only the drum replacing the disc. Faster nutrient delivery: The less dense pellets created in pelletizing can withstand handling, but can still quickly break down upon application, an ideal characteristic for soil amendments, fertilizers, and other applications that benefit from fast material breakdown. Less dust and fines are produced compared to compaction: Since pellets are round, there are no edges to break off and create dust. Binders can serve as beneficial additives – Pelletization offers the opportunity to control formulation, through the addition of specially formulated binders, in order to create optimum pellet characteristics. Higher Processing Costs: The use of a binder, and the required drying step results in higher processing costs when compared to compaction granulation, though the pelletization method often requires a lower capital investment. A Skilled Operator is Required: Pelletizing (on a disc pelletizer) requires a well-trained and skilled operator to produce a pellet with desired quality and characteristics, and to keep the process running smoothly. Compaction granulation operates on the principle that some materials, when put under extreme pressure, will bind to themselves. Not all materials are capable of this, so in some cases, compaction granulation is not an option. But for other materials, such as salts like potash, it is an extremely effective, cost-efficient option. 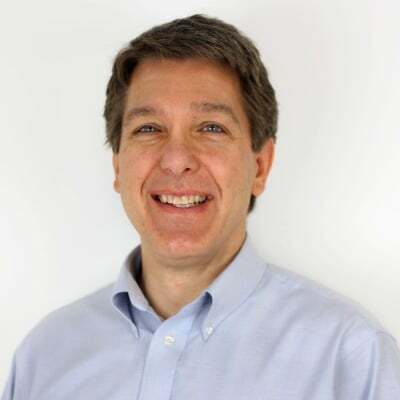 It’s worth noting that an additional option, briquetting, which is similar to compaction, is available, but better suited for specific applications where larger agglomerates are desired, such as the production of charcoal or water softener briquettes. Because the material adheres to itself in the compaction process, typically no binder (or very minimal binder) is needed to agglomerate the material fines. Therefore, this is considered a dry process, and most times does not require an additional drying step. Compaction granulation is carried out using a double roll press, or roll compactor. Material is fed between two counter-rotating roll presses. The rolls apply extreme pressure, to press the material into a sheet-like form. This sheet of material is then fed through a granulator, where it is broken up into uniformly sized granules. At this point, the resulting granules can be considered a final product and move on to packaging or storage. However, some processes implement an additional stage, where granules are conditioned. This can take place in a paddle mixer, or a coating/conditioning drum. Here, any desired additives can be included, such as coating or anti-caking additives. This step also serves to “polish” the granules, breaking off any loose edges, and filling in any surface cracks. The diagram below illustrates a simplified compaction granulation process, with a polishing drum. Lower Processing Costs: Because no binder or drying step is needed, processing costs are significantly lower when compared to pelletization. Attrition: Attrition is the breakdown of granule edges into material fines and dust. This is common with compaction granules because of the rough, jagged edges. As mentioned, however, there are methods to aid in reducing attrition, but they can increase production costs. The chart above summarizes the differences between compaction granulation and pelletization. 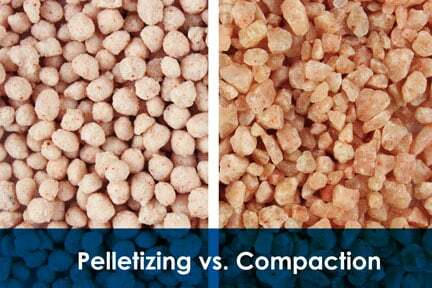 As can be seen, both compaction granulation and pelletization offer a host of unique advantages and disadvantages. Material, end product characteristics, processing requirements, and cost will all factor in to the decision between the two methods. Additionally, some materials may only respond well to one of these methods, making the choice clear. Other materials however, will respond well to both (such as bentonite, coal, humate, potash, urea, and others) and will require further consideration. Sometimes, it’s also sufficient to simply condition material in a pin or paddle mixer. This is common for applications where the material only needs to be de-dusted, such as in cases where transportation to landfill is made difficult because of a dusty product. Often times, it’s not clear which method of agglomeration will produce the desired results. In these cases, feasibility testing is recommended, and often required. Running feasibility trials with samples of your material in a lab such as FEECO’s will offer a number of benefits. It will not only tell you if your material is capable of agglomeration, but it will also determine the best method of agglomeration to achieve the end product you’re looking for. Taking it a step further, in addition to running batch tests on a single piece of equipment, the FEECO lab can also do testing in a continuous process loop, utilizing many pieces of equipment. This is useful in determining the best equipment configuration and process variables needed to produce desired product characteristics. FEECO has been helping companies with their material problems for over 60 years. Whether you need a compaction granulation circuit, a disc pelletizing system, or even if you’re not sure what you need, FEECO can help you determine the right process for you, as well as manufacture the equipment to get the job done. For more information on agglomeration systems, or feasibility testing, contact us today!